We have an exciting opportunity for a positive, highly skilled and people-focused self-employed Physiotherapist to join our great team. The role is 34hrs a week. We are a busy dynamic established practice based in Ealing Broadway, London. The practice has 3 treatment rooms and is supported by a strong administration team. We are a dynamic team of 5 great physios. The ideal candidate will have at least 5years of neuromusculoskeletal experience, and excellent skills in the assessment, diagnosis and treatment of all neuromusculoskeletal conditions. The candidate will be highly self-motivated, enthusiastic, positive and want to work as part of a successful team to build their caseload and relationships with existing referrers. The candidate will receive clinical support, fortnightly structured CPD and in-service training. External CPD courses and training will be paid for in keeping with the candidates learning objectives and career direction. Excellent remuneration of between £45K-£50K depending on experience and caseload. Please send your CV plus a covering letter to accounts@w5physio.co.uk or post to W5Physio, 27 Haven Lane, Ealing, W5 2HZ. W5 Physio has turned a striking shade of pink for the whole of January in support of Breast Cancer Campaign. All physio staff are wearing specially branded shirts in breast cancer pink for the month to raise money for a brilliant cause. The clinic has been covered in pink stars – for 50p, anyone can guess the number of stars to win a free treatment! W5 Physio’s sponsored local rugby team, Hanwell RFC, have continued their good start to the new season with a fantastic come-from-behind last minute victory in the Middlesex Vase Competition, against opponents Hammersmith & Fulham, who play in a higher league and were undefeated coming into the Hanwell match. 2 early tries to H&S saw the scoreboard read 0-14 against Hanwell who initially struggled to get into the game. Hanwell fought back to trail 10-21 at half time, and then scored a try in the 78th minute to get to 20-21 to H&S, but painfully, the conversion was unsuccessful. But, dear reader, Hanwell were not finished yet. Here’s Hanwell RFC co-founder John Bodman to re-tell the epic conclusion! “With the referee indicating that the game would restart with just 1 minute left the play, the home side gathered the restart and began to make progress into the opposition half. Building phase after phase, the Hammersmith defence was stretched to the point where they halted the Hanwell attack illegally. With the penalty awarded to the home team, the referee advised that this was to be the final play and that Hanwell could not kick for touch. Flanker Michael Durkin, thinking quickly, took the tap penalty and headed directly for the Hammersmith defenders, hoping to gain a further penalty for the visitors not retreating the full ten metres. However, in their rush to get back, two Hammersmith defenders turned their back on Durkin, who ran for the space between them. With just the fullback to beat, Durkin opted to run over the defender rather than risk going around and he grounded the ball deep in the corner to give Hanwell a last gasp victory. With the win already sealed, fullback Kevin Falvey stepped forward to take the hardest conversion of the game, far out wide. This time, the ball flew straight through the centre of the yellow ribbon covered posts to bring a breath taking game to an end and put Hanwell through to the next round”. Good luck in the next round from all the team at W5 Physio! W5 Physio’s Stewart and Patsy Complete Ealing Half Marathon! On Sunday the 28th September, W5 Physio’s Stewart Ramsay and Patsy Hayden completed the 2014 Ealing Half Marathon in very tough (hot!) conditions. Nearly 6000 runners took part in the event, which has won numerous awards for atmosphere and enjoyment in its brief history, but never before had it been this hot, with temperatures quickly rising to the mid 20’s. “It was baking hot” said Stewart during his well earned sports massage the following day. “Stewart and I just stuck together” said Patsy, “Neither of us were interested in a specific time because of the weather, and it was a great decision in the end – we just egged each other on and kept each others spirits up”. Sadly, Ealing resident Andrew Carter, who was only 33, passed away in a local hospital after collapsing near the finish of the race. After receiving immediate care at the race, he passed away on Wednesday 1st October 2014 in hospital. W5 Physio would like to express our deepest condolences to Andrew’s family and friends. A beautiful statement from the family can be read here on the Ealing Half Marathon website. W5 Physio Channel Live On Youtube! We are pleased to inform you there is now a W5 Physio Channel on YouTube, with dozens of videos showing correct technique for some of the more popular gym based exercises. It is absolutely essential whenever you are doing any exercises, in the gym or at home, to do so with the correct technique. If you are unsure of how to do any activity, please grab a personal trainer if in the gym, or contact us about a home exercise. Be safe! The countdown is on – the 2014 edition of Movember at W5 Physio is upon the unsuspecting populace of Ealing! Last year, the Movember initiative raised £20.4 MILLION in the UK alone, helping fund raise for Testicular and Prostate Cancer research, and funding for men’s mental health programs. “The Movember community has raised £346 million to date and funded over 800 programmes in 21 countries. This work is saving and improving the lives of men affected by prostate cancer, testicular cancer and mental health problems. Slightly dodgy updates will be posted on Twitter and Facebook, get ready! Our great friend Stefano at @Saddledrunk is riding a fold-up bike, a Dahon Vitesse (with 20 inch wheels!) all 270km from London to Paris on the 12th of September 2014 for Oakley Waterman Caravan Foundation and Prostate Cancer UK. Stefano will be riding with his friend Stuart Carpenter, and his father in law, Nonno Pippo. Stuart describes the reason for supporting the Oakley Waterman Caravan Foundation beautifully in their challenge blog here. Stefano has chosen Prostate Cancer UK, a disease affecting some 250 000 men in the UK. All details of how to sponsor Stefano and Stuart (and Nonno) can again be found in their blog here. W5 Physio’s Stewart has stepped up and will be providing physio support, meeting the boys in Paris (after spending a Eurostar trip in the bar) at the destination for a well earned recovery session. We wish Stefano, Stuart and Nonno all the best on their epic ride, if you are able to give any donations to their challenge, please click here. 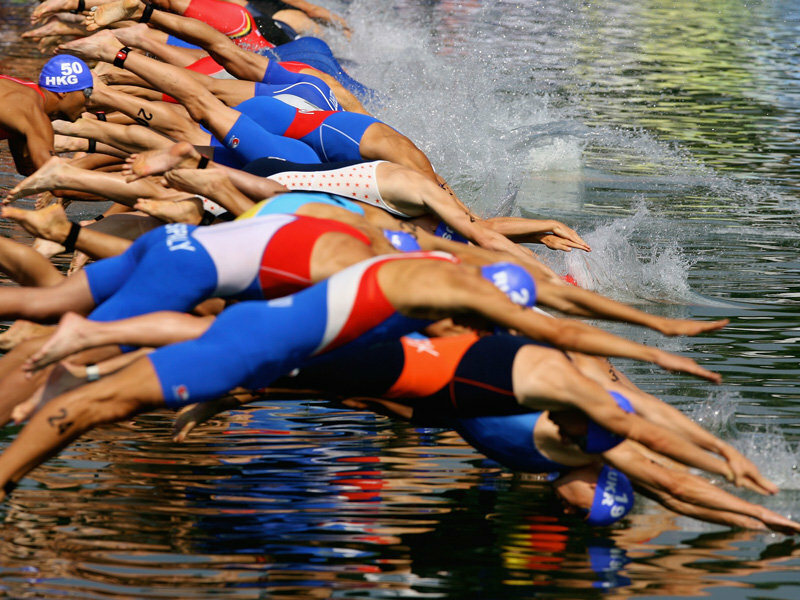 After 6 months of event training, the Commonwealth Games are upon us – W5 Physio’s own Greg Bagley is off to head up the team at the triathlon venue, the beautiful Strathclyde Country Park. 47 male and 29 female athletes from 16 countries will be racing at the Games, over the ‘standard distance’ of 1500m swim, 40km bike followed by the 10km run leg. There are 2 events at the Games, an individual race for men and women (Thursday 24th July), then a mixed relay event on Saturday the 26th. As Lead Physiotherapist, Greg will be in charge of the Athlete Medical Room at the triathlon venue, supervising a team of sports medicine doctors, physiotherapists, massage therapists and first aid crews. The undoubted favourites for the mens gold medal will be England’s sensational Brownlee brothers, Ali and Jonny, who claimed Olympic gold and bronze respectively at London 2012. Stiff competition should come from traditional triathlon loving countries Australia, New Zealand, South Africa and Canada, but on their day, the brothers Brownlee are peerless. The women’s race is a slightly more open one. Welsh world champion Helen Jenkins has recently had to pull out through injury, and was in great form before injured. Again, Aus, NZ, SA and Canada will all fancy claiming gold along with Wales and England, it should be a fantastic race! Hopefully Greg and the venue medical team won’t be called upon to help any athlete mis-fortune, but if needed, immediate help will be there. Good luck Greg and all the athletes! W5 Physio’s Stewart Completes Tough Mudder! W5 Physio officially has a Tough Mudder – Stewart and his team (No Limits Soldiers) has completed the gruelling event all in the name of charity! Tough Mudder is a 10-12 mile obstacle course event through mud, over obstacles, over hills, and even electric fence, an event designed to test strength, stamina, teamwork and mental grit. Only the tough compete, and only the toughest complete! Pic – Stewart getting a helping hand from teammates… Luckily for him they were in tremendous shape! Stewart and his teammates Gavin, Tony, Andrew, Jason, Jason D, Rodney, Wayne, Ki and Co have raised an incredible £3150 for their chosen charity of Macmillan Cancer. “The event was brilliant, painful but brilliant” said Stewart. “As the organisers say, its not about the course time, its about working together as a team and overcoming the challenges in front of you together. But at the end of the day, the event was just an excuse to raise money for the amazing Macmillan charity, we’re all really proud to support them”. We are very excited to announce that W5 Physio can now offer our patients real-time ultrasound scanning to assist in the diagnosis and management of their musculoskeletal injuries, at no extra cost. “The Ultrasound scanner is a brilliant adjunct to a patients’s treatment” says senior physio Taryn Schutz. “It allows us to clearly show the actual injury, I’m real time. This isn’t just great for confirming diagnoses, but we can then use the scanner to show the progress of the injury on each subsequent physiotherapy session”. Here is an example of a scan of a partial tear of a calf muscle (Grade II tear medial head of gastrocnemius). From the image, we can see the tear of the muscle fibres creating the black oval shaped ‘hole’ in the middle, the blackness is blood within the muscle as a result of the tear. During each treatment session, we would re-scan the injury to show the patient the formation of new muscle fibres as we help heal the muscle, then progressively strengthen it to result in a full recovery. If you have any questions about the ultrasound scanner at W5 Physio, its uses or treatment options, feel free to give us a call.